Wentworth pulled his hat down on his head as he kicked his horse to go faster. The evening was warm but the wind was brisk. It stung his face as he leaned over his horse. The British were coming and he had to tell the minutemen. 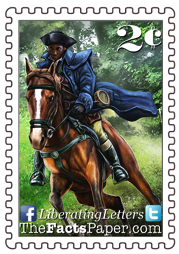 As Paul Revere and William Dawes raced west towards Lexington from Boston that fateful night of April 18, 1775, predominant black patriot, Wentworth Cheswell, was headed north. (see The Shot Heard ‘Round The World) In fact, Cheswell was so integral in the colonists' fight for freedom, he is considered a Founding Father. Cheswell was born April 11, 1746, in Newmarket, New Hampshire. His grandfather was the first known Cheswell in New England. Richard Cheswell was an enslaved laborer in Exeter, New Hampshire, who bought his own freedom. In 1717, Richard purchased 20 acres of land on October 18th in what became part of the town of Newmarket, making him the first known black landowner in New Hampshire. Richard married a free white woman and together they had one known child, Hopestill Cheswell. As children inherited the slave status of the mother at the time, Hopestill was born free. He was a successful house builder and carpenter, lending his talents to the Bell Tavern in Portsmouth, the John Paul Jones home and the Samuel Langdon House. Hopestill also purchased over 100 acres, which he farmed. In addition, he became part owner of a sawmill. Hopestill married Katherine Keniston, a white woman, and they had Wentworth Cheswell. Hopestill’s good fortune allowed him to provide a formal education for his son at Governor Dummer Academy in Byfield, Massachusetts, unseen by most, especially a descendent of a former slave. Upon graduation in 1765, Cheswell returned home to become a school teacher in Newmarket. He also purchased his first plot of land from his father. Within two years, he had 30 acres of land, owned a pew in the meetinghouse/church and married 17-year-old Mary Davis. A year later, he and his wife welcomed the first of their thirteen children. By 1770, his estate had grown to 114 acres. In 1768, at the tender age of 22, Cheswell was elected town constable, becoming the first known black man to hold public office in the Americas. In fact, he held some sort of public or government office, including selectmen, auditor, scrivener (notary), assessor, coroner, town moderator and justice of the peace, until his death in 1817, except for the year 1788. However, it was his election as town messenger for the Committee of Safety that introduced him to Paul Revere. As there were no phones, TVs, radios, text messages or even telegrams at the time, messages traveled by carriers, usually on horseback. The Committee of Safety was the lifeline of the American Revolution, carrying intelligence and messages between tactical command centers. Cheswell was responsible for taking news to and from the Provincial Committee located at Exeter. When the British warships Scarborough and Canseau were headed to Ft. William and Mary on December 13, 1774, in attempts to re-take it, Cheswell and Paul Revere rode to Portsmouth to warn the citizens. Cheswell continued on to Exeter for instructions for troops traveling to Portsmouth. Four months later, when the British arrived to arrest Samuel Adams and John Hancock, as well as take the colonists’ weapons and ammunition, Cheswell was again there. He rode north, alerting the minutemen that “the British are coming.” A third of the men rushing to confront the retreating Red Coats were notified by Cheswell. Cheswell was a patriot to the core. When Thomas Jefferson, John Adams, John Hancock, Benjamin Franklin and the 52 other signers stated, “And for the support of this Declaration, with a firm reliance on the protection of Divine Providence, we mutually pledge to each other our Lives, our Fortunes, and our sacred Honor,” they were not alone. (see God's Divine Providence) In April of 1776, Cheswell and other wealthy citizens signed a document pledging, at the risk of their lives and fortunes, to take up arms against the British. The document supported and encouraged the Second Continental Congress to declare independence from Britain. But Cheswell did not just lend his signature to the cause. He enlisted in Colonel John Langdon’s Company of Light Horse Volunteers. Cheswell fought in the first major victory for the patriots in the American Revolution at the Battle of Saratoga on September 19, 1777. A month later, on October 31, 1777, his service ended as he needed to return home to support his family. He continued teaching as well as running a store next to his schoolhouse. The following spring, Cheswell was elected to participate in the convention to draft the state’s first constitution. Unfortunately, he was unable to attend for some unknown reason. Among all his other duties, Cheswell began a personal campaign to copy town records beginning in 1727, probably the year of the town's founding. He included notes of church meetings, old stories of the town up to current events and other town information. He also wrote assessments on local artifacts and relics which granted him the title of New Hampshire’s first archaeologist. In addition, Cheswell helped found the Newmarket Social Library in 1801 to preserve and share this information. Upon his death from typhus in March 8, 1817, Cheswell donated his personal library to the town’s library. He is buried on his family farm along with many of his descendants. As time went on, many of his progeny had no idea they had African blood in their veins or that their ancestor was so active in the formation of this country. Since Cheswell was only 1/4th black, many believe his features favored those of his white ancestors. In fact, he is listed as white in the census reports. However, enough records exist to prove of his African heritage and that he contributed immensely to the freedom of America. As a matter of fact, during the 1820 Missouri Compromise debates, abolitionists used his life as an example that blacks can be socially equal to whites. Wentworth Cheswell was a leader in the classroom, the church, and the community. He preserved history, both written and physical. Cheswell selflessly served his community and his country his entire adult life. He was a teacher, a veteran, and undoubtedly one of America’s Founding Father’s. Liberty, the stories of black leaders like Cheswell have been suppressed in American History because an agenda of victimhood has become too valuable for those seeking power. You cannot convince African-Americans they have been enslaved from America's inception if the lives of patriots like Cheswell are able to be told. Therefore, it is up to us to do our own homework and find the truth. We, as Americans, owe it to patriots like Cheswell to discover and share their stories of liberating America. They deserve to be honored for their bravery, not forgotten because they destroy an agenda.